Côte St. Luc filed a motion in Quebec Superior Court last year calling for the dismissal of a 15-year-old $20 million lawsuit brought by the developers of the Meadowbrook Golf Course against the city, Councillor Dida Berku told The Suburban Friday. The motion to dismiss is expected to be heard in April. The original lawsuit was brought by previous developers when Côte St. Luc rezoned its portion of the golf course from residential to recreational. The golf course is also in Lachine and part of Montreal West. The news of the dismissal motion comes as the Montreal city council and agglomeration council were expected to approve a land use and development plan this week changing the whole site’s designation from residential to recreational. Groupe Pacific, the current developers of the golf course land, has already filed a $44 million lawsuit against Montreal, after plans for housing on the Lachine side were twice rejected by the city. Regarding Côte St. Luc’s motion to dismiss, Berku pointed out that the developers’ lawsuit stayed in limbo for 14 years. “Côte St. Luc made the call [to file a dismissal motion] last year when we found out about the $44 million lawsuit. We figured, we might as well get it to Superior Court and clear this up. Groupe Pacific was not available for comment at press time. Regarding Montreal’s land use designation change, Berku said that the mayors of Côte St. Luc and Montreal West, and those in Montreal “responsible for the planning and green space portfolios, will be meeting to further our common strategy, to see how to deal with this dossier. “But what’s most encouraging, and what’s different today than before this decision was made, was the commitment, the undertaking Mayor Coderre made, that we will see this through and work together for a common purpose. 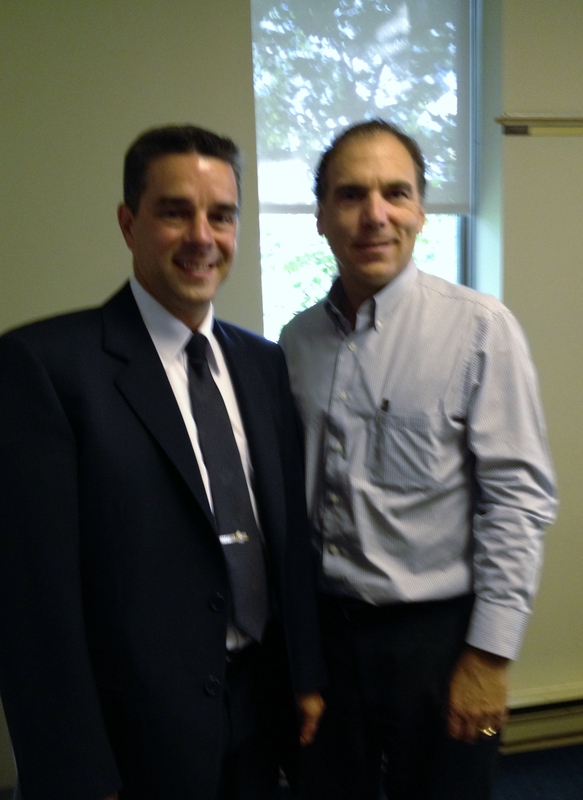 Côte St. Luc Mayor Anthony Housefather was thrilled with the news of the land use designation. “Protecting Meadowbrook has been something I and the council members, particularly Dida Berku, have been advocating for decades and was one of my key election promises in 2005 the first time I ran for mayor and a key element of the 2006 Côte St. Luc Strategic Plan,” he said. Montreal West Mayor Beny Masella said the news is great for his town and the island as a whole. 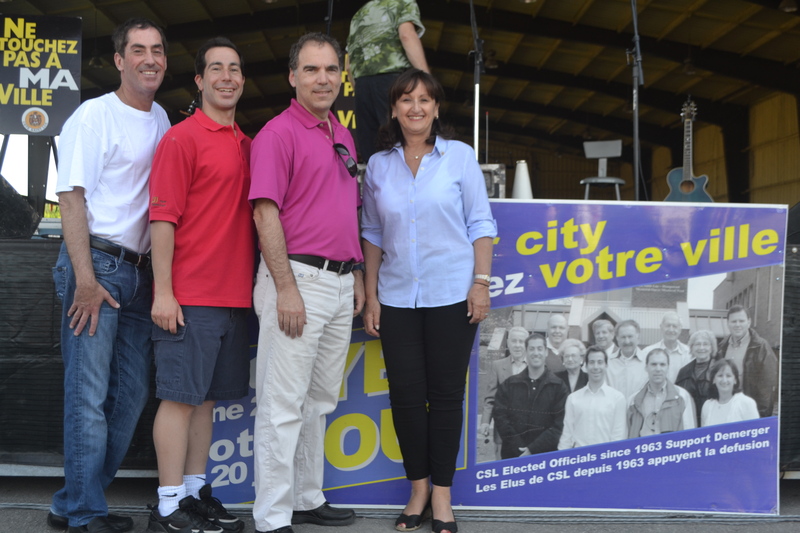 Bright sunshine greeted hundreds of happy residents of Cote Saint-Luc, Hampstead and Montreal West last Sunday at the concert marking the 10 year anniversary of the demerger from the megacity. The feature performers were political-comic-balladeers Bowser and Blue. 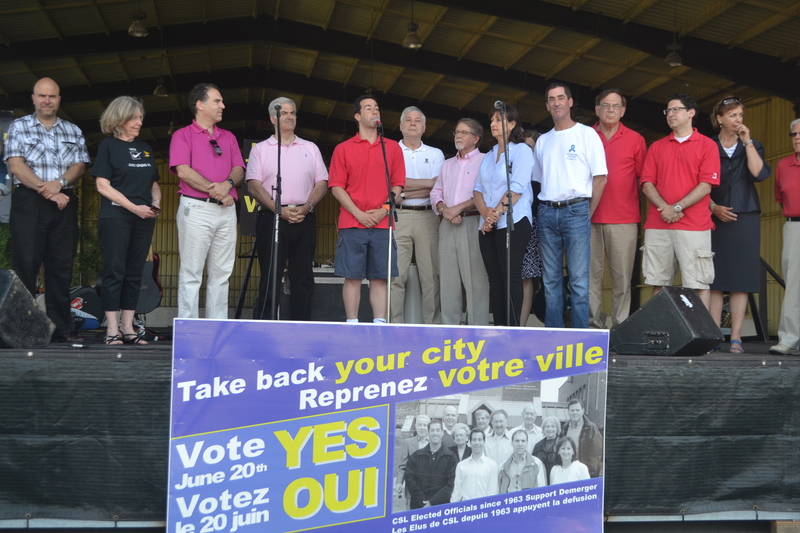 The mayors and councillors took to the stage to revel in regaining their cities and touted the virtues of lower taxes, better services and happier residents than during the PQ government imposed four-year mega-merger fiasco. 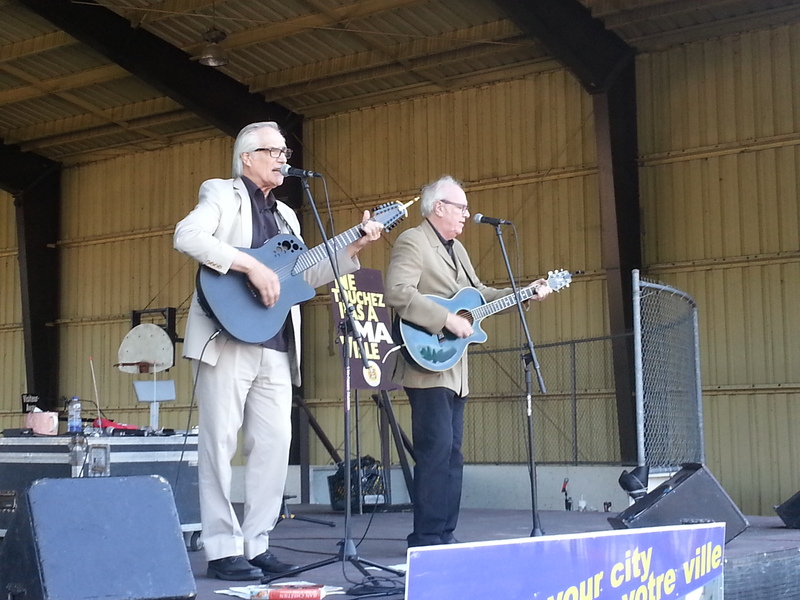 George Bowser and Rick Blue entertained in their usual, clever and witty way, poking fun at Anglophones, Francophones, Montrealers, Quebecers and Canadians. They laughed at Montreal’s state of street repairs and crumbling overpasses, the Champlain Bridge and at our various accents and unique ways of saying Bonjour/Hi to begin a conversation with strangers. Last week the three communities placed blue ribbons along their main streets as a reminder of the campaign that took place a decade earlier whereby the ribbons served as a symbol for those seeking to demerge. Then Borough Councillor Anthony Housefather served with Mitchell Brownstein, Ruth Kovac and myself as the CSL Demerger co-chairs. We worked tirelessly, with an army of dedicated volunteers, in an election-style battle like we had never seen. Despite the difficulties the Liberal government introduced to regain our cities we succeeded with a successful referendum with the yes vote placing in the high 90% range. Cote Saint-Luc and its neighbouring towns, along with a handful of other suburbs were legally demerged from Montreal to carry on as autonomous municipalities, as was the case for nearly a century. Q. Are the new sidewalk extensions on Westminster Ave. N. in Montreal West an error? My theory is the people who designed them and the person who contracted it miscommunicated. They appear to have been made too wide. Cars can’t even make the turn safely from the side street going north onto Westminster because it is next to impossible to not cross over the line into ongoing traffic, forget about any larger vehicle. Buses and large trucks now hit the curb. A. 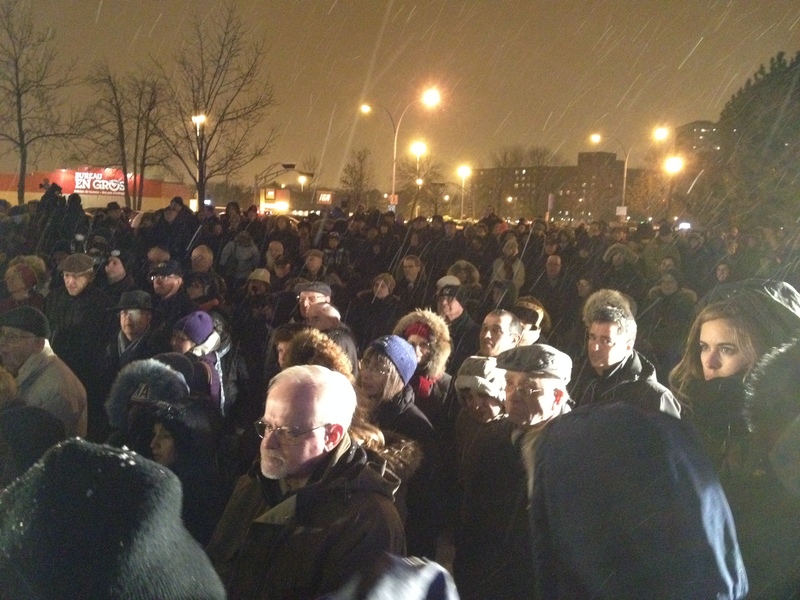 There was no error, says Montreal West Mayor Beny Masella. He said the sidewalks are being widened at two intersections – where Westminster meets Curzon and Parkside Sts. – to get drivers to stop at stop signs. The project cost $140,000. During public consultations in 2008, residents complained about lead-foot drivers on the street, Masella said. Westminster splits Montreal West in two. “All the recreation locations and all the schools are on the west side so I have a lot of people crossing that street,” Masella said. The town called in a traffic engineer, whose sidewalk-extension plan was validated by another engineer, Masella said. Thanks to the new extensions, cars driving either north or south on Westminster now have to slow down and stop when they reach Curzon and Parkside. “Because the extensions are in your way, you cannot continue in a straight line you have to curve around them,” Masella said. Having the curb jut out into the street also makes pedestrians more visible. New markings on the road make it clear where cars turning from side streets have to be when they’re turning, he added. Cars have a full lane to turn into. Some residents fear the new curb extensions won’t be visible in winter but Masella said he does not expect problems because Westminster is the first road that gets cleared after snowfalls. Another major problem on Westminster has to do with train tracks that cross the street just south of Sherbrooke St. Dozens of commuter trains a day set off railway-crossing barriers, backing up traffic on Westminster, Sherbrooke and many nearby cross streets. The Agence métropolitaine de transport has been studying ways to alleviate the problem, which is expected to worsen as new train departures are added. Masella said the AMT is expected to reveal results of the study to the town soon. Options include a car overpass or underpass but Masella said those options aren’t feasible because they would destroy Westminster’s business district. Whatever option is chosen, a proposed fix is expected to cost tens of millions of dollars, money that the AMT currently doesn’t have. These ominous words uttered by Mayor Anthony Housefather echoed off the walls of Cote Saint-Luc city hall in an impassioned speech that delighted the crowd. 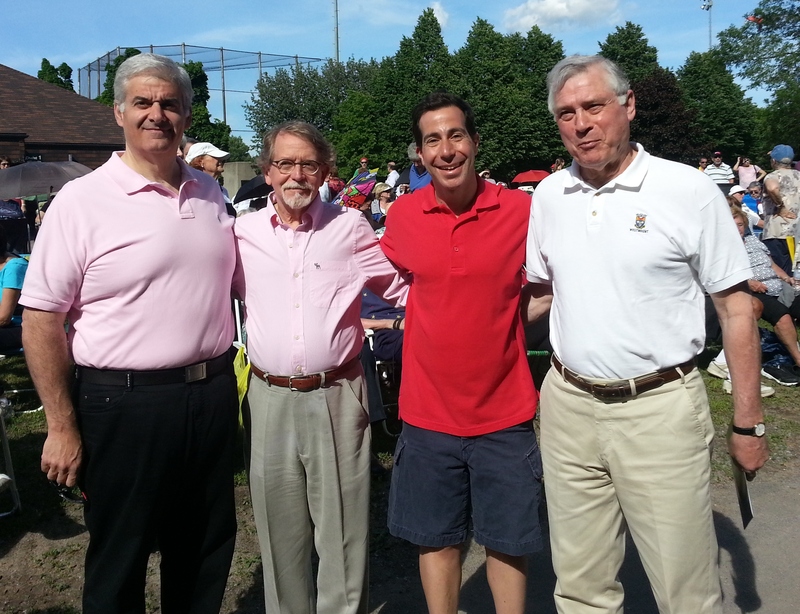 Major personalities to take the microphone included Rabbis Chaim Steinmetz and Reuben Poupko, Father Peter Laviolette and Mayors Bill Steinberg of Hampstead and Beny Masella of Montreal West. Housefather gave an electrically charged plea to about 700 enthusiastic residents who cheered him on in great support before he even uttered his first word. “This is an odious bill that sends a message that some Quebecers are more equal than others,” Housefather said. “This is not the charter of most Canadians, most Quebecers or most Cote Saint-Lucers,” the mayor added saying that the government can remain secular. with equality between men and women without needing such legislation. 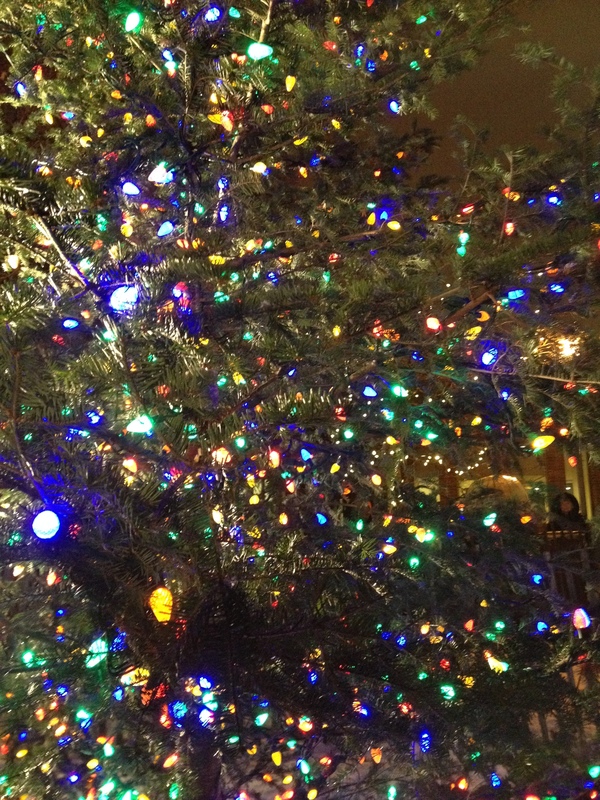 “We can light the Christmas tree and the menorah in front of city hall, we can employ staff wearing hijabs, kippas, turbans or crosses, and none of this interferes with offering excellent services at fair rates to our taxpayers,” said Housefather. The mayor added that the city will never fire anyone for displaying their religious convictions and that we will go to court to fight this bill should it ever become law. Housefather ended with a poignant reminder citing former Canadian Prime Minister Pierre Elliott Trudeau’s famous quote that the ‘State has no business in the bedrooms of Canadians’. “Well, I say that the state has no business in the wardrobe of Canadians,” the mayor emphasized, to wild applaud. Mayor Bill Steinberg announced his council was set to adopt a resolution after the rally vowing to ignore and to fight Bill 60 if it were ever to be adopted into law. Mount Royal Liberal MP Irwin Cotler was unable to attend the rally, but he sent a message calling Bill 60 ‘the Charter of shame’. After the rally, the large crowd moved over to the giant menorah where Chabad Rabbi Mendel Raskin, just back from his native Casablanca, Morocco, and Rabbi David Cohen led them in song and celebration. My view from up above as a light the giant menorah. The crowd spills into Cavendish Blvd. as limos wait to begin the parade. 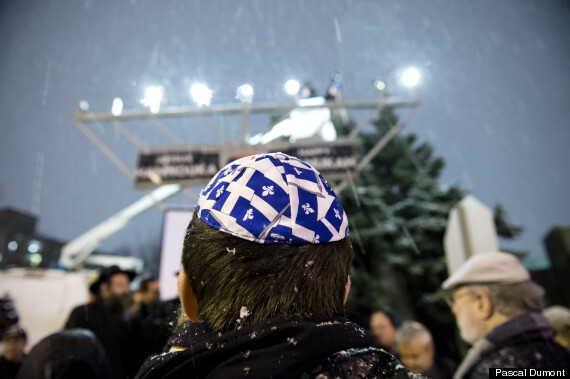 In Chabad tradition, jelly-filled donuts were passed around along with dreydles and Chanukah-gelt (Chocolate coins) and several youngsters were chosen to ride in limousines – with illuminated Chanukah menorahs atop their roofs – through the streets of Côte Saint-Luc, holiday melodies blaring for all too hear. West-end mayors vow to defy values charter | The Canadian Jewish News. 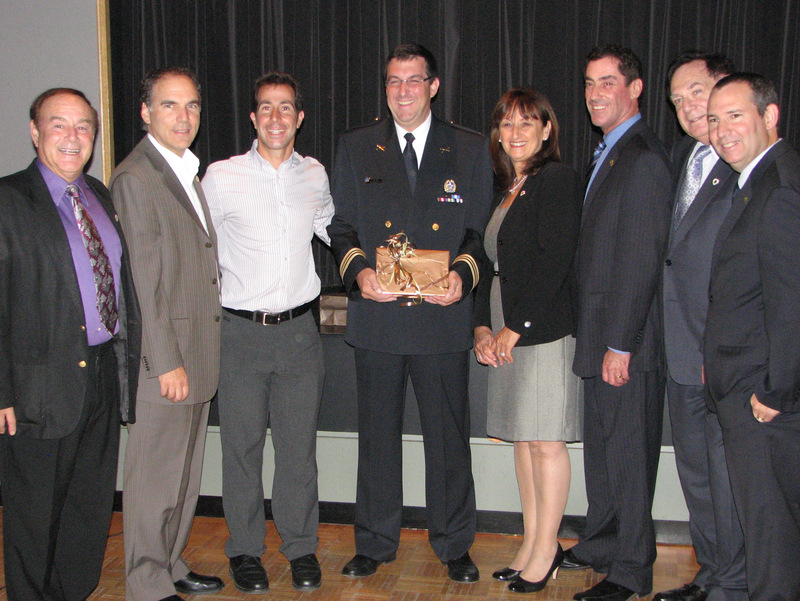 The mayors and many councillors of the cities of Cote Saint-Luc, Hampstead and Montreal West held a small reception to honour and thank outgoing Police Commander Sylvain Bissonnette. Bissonnette wrapped up his duties at Neighbourhood Station 9 last week and moved over to head up Station 8 in Lachine. Mayor Anthony Housefather thanked Bissonnette for his exemplary service saying he will leave big shoes to fill. As councillor responsible for public safety, I met and spoke to Commander Bissonnette quite often. He showed great understanding and sensitivity to not only the Jewish community but the greater community, its multicultural characteristics, and to our seniors. His co-operation with city officials was exemplary. I’ve worked with many station commanders, and I’m saddened to lose him. He’s an outstanding leader. Bissonnette’s encouragement and assistance in the launching of the volunteer Citizens’ on Patrol about six years ago was fantastic. Bissonnette recognized that vCOP is an asset, not a hindrance, to the work of the police. He was a partner in this project from day one, helping with the planning and training. It’s in great part due to his vision and willingness that Cote Saint-Luc has the lowest crime rate in the Montreal agglomeration. We have said adieu to veteran commander Sylvain Bissonnette who has vacated his Cote Saint-Luc office in Neighbourhood Station 9 to make room for incoming commander Marc Cournoyer. The change in command took place last week. Cournoyer, a 25 year veteran of the force has held positions in many parts of the Montreal territory, including Hochelaga-Maisonneuve, Park Extension, and Pointe Claire. He began his police service out of the station in Westmount. His work included assignments on the morality squad and working with women suffering from domestic violence. The new commander looks forward to working in partnership with the Public Security departments in the three cities as well as with the volunteers of CSL EMS and vCOP. The first days of Commander Cournoyer’s introduction were far from ordinary with a stabbing incident on Kingsley Road, a rare occurrence in this city. As he entered City Hall for his first formal meeting with Mayors Housefather, Steinberg and Masella, City Managers and myself earlier this week, the commander was stopped by a lovely older lady with a walker and was complimented on his suit. “You’re fine looking gentlemen,” the woman said. “Are you all from the same group?” she quizzed to the current and former commanders along with a regional chief. I interjected that they were police officers, which she politely brushed off. “Such handsome men, are you undertakers?” she joked. The commander pulled back his jacket to reveal a shiny police badge and a service revolver. “Oh my,” she said, her eyes wide in astonishment. “I better let you get on with your business,” as she shuffled off. This began the next step in Cournoyer’s career. 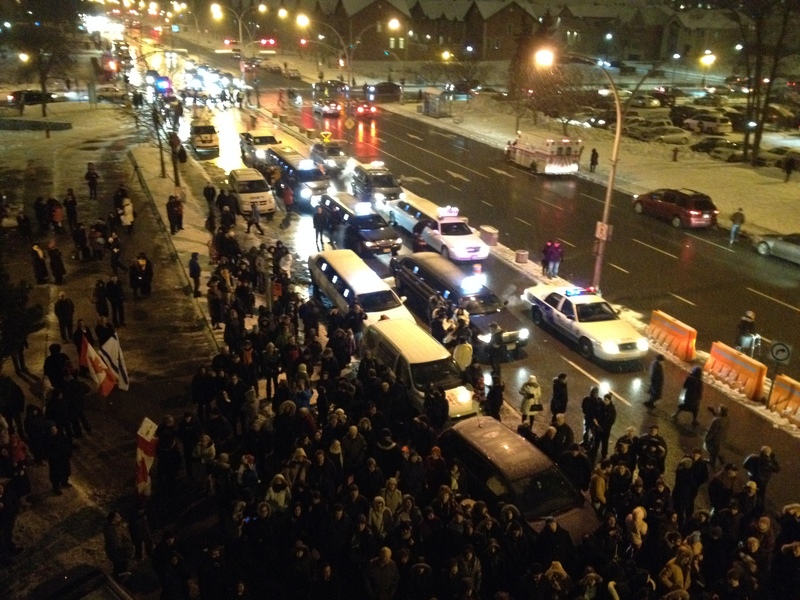 The unknown and unpredictable nature of policing in Cote Saint-Luc. I look forward to working closely with the commander in ensuring Cote saint-Luc’s position as the safest community in the region. Felicitations Commandant Cournoyer. We wish you a long and successful career in our city. Federation CJA held a small reception on Tuesday evening in honour of Police Station 9 outgoing commander, Sylvain Bissonnette. 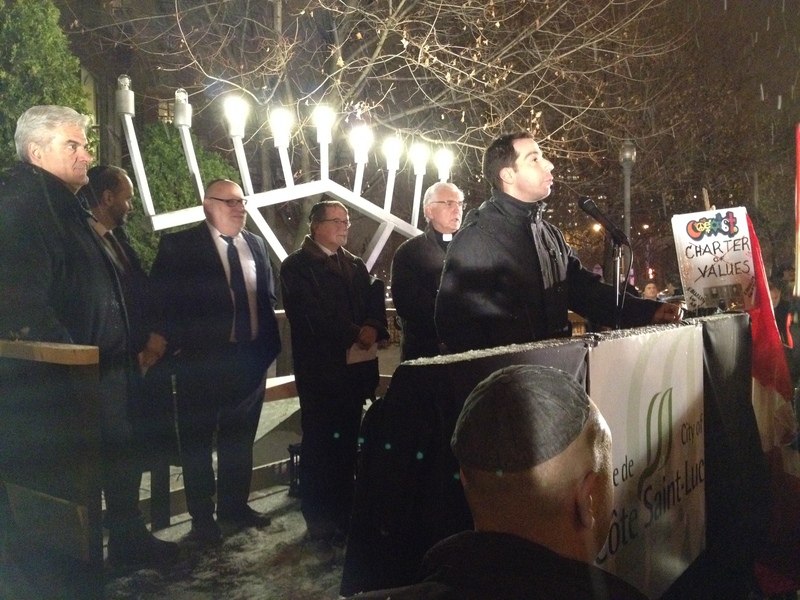 Montreal Jewish Community Security Coordinating Group chairman Rabbi Reuben Poupko was joined by Federation CJA Operations Chief Moshe Ben Shach and Community Security Director Adam Cohen along with local police commanders and community members involved in security. 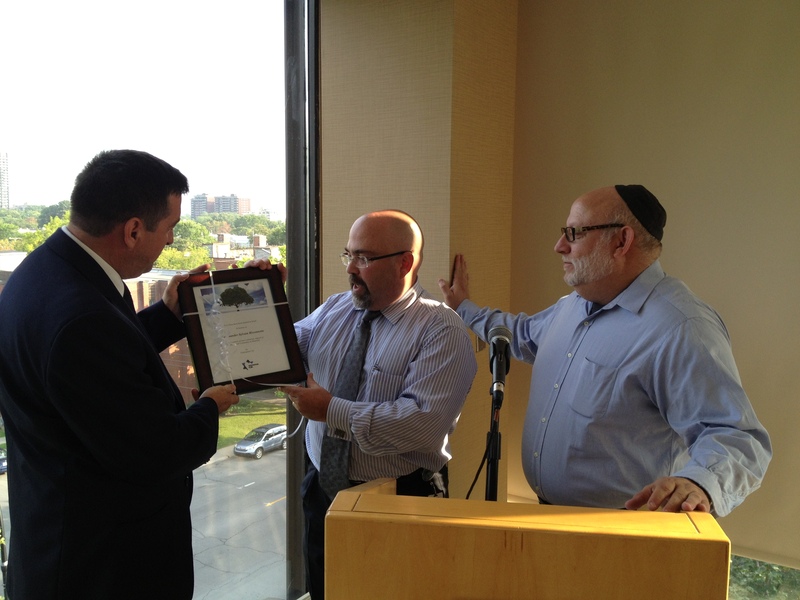 Poupko and Ben Shach noted that Bissonnette was an exceptional police representative who made enormous efforts in getting to know the Jewish community well. They credited him with providing excellent police services particularly during tense times in the Middle East and when an outbreak of stone throwing had been perpetrated against Jewish institutions here in the West End of Montreal. In his remarks, Bissonnette said that when he took on the role of commanding the police force in Cote Saint-Luc, Hampstead and Montreal West he wanted to understand more than the residents. He wanted to understand their parents, grandparents, their culture and their history. Bissonnette himself is a historian and his academic training served him well in his role as commanding officer in a territory that is rich in Jewish and multicultural communities. The three cities are officially bilingual, with a strong sense of attachment and involvement, he noted. This marks Commander Bissonnette’s last week in charge of PDQ9 before heading over to take up command in Lachine. In the words of the commander, we don’t say good-bye to our friends, we just see them less often. Bon voyage et bonne chance monsieur le commandant.